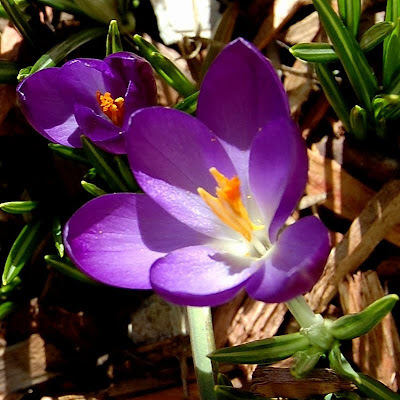 Today I stepped outside and saw this very welcome sign of Spring - there are crocuses blooming in our front flowerbed! Just a few clusters have started - one dark and one light purple. This makes me very happy - I like Spring and Fall better than Summer and Winter! I hope you have been able to see all of the posts I have made on the Everyday Cricut blog as Guest Designer this week. It is a little hectic posting in two places! Today I shared this layout. The file is available to download at the bottom of this post but you should read all of the details in the post on Everyday Cricut to help answer any questions about the design. I also made four more "leftovers" cards. These are great for little notes and so much fun to make. Here are a few more details on each card. I really like the Core'dinations gemstone cardstock and I don't want to waste any of it! This color blocking card has a 5 1/4 x 1 1/2 inch yellow strip, a 2 1/2 x 1 1/2 blue strip and a 1 1/2 x 2 inch pink strip. They are placed flush to one another on the card front and the green circle at the intersection is punched with a 1 1/4 inch punch. 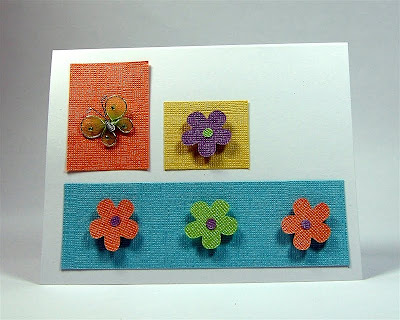 The butterfly is from Creative Charms and the flowers are offcuts from the Easter Egg cards I posted on Monday. On this card the patterned paper is a leftover from the boy and girl images on the scrapbook layout. It is 2 x 3 3/4 inches. 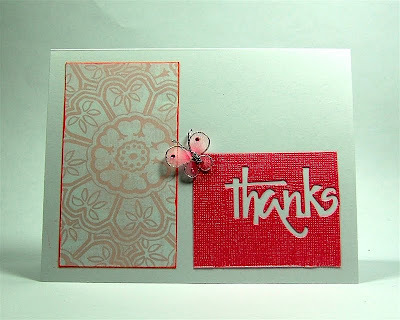 The pink negative of "thanks" is a "leftover-leftover" from yesterday's egg card and is 2 x 2 1/2 inches. The butterfly is again from Creative Charms. Another color blocking card - the blue strip is 5 x 1 1/2 inches, the orange strip is 1 1/2 x 2 inches and the yellow is 1 1/2 x 1 1/4 inches. This time they are evenly spaced with with areas between. (I need to add a bit of adhesive the the orange piece - it wants to curl up off the card!). The butterfly is from Creative Charms. 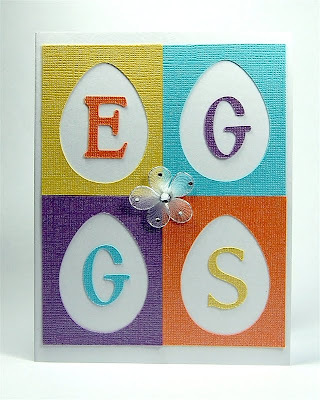 This was the most fun to make - I used the scraps from cutting the eggs for the layout and reversed the colors on the letter placements. 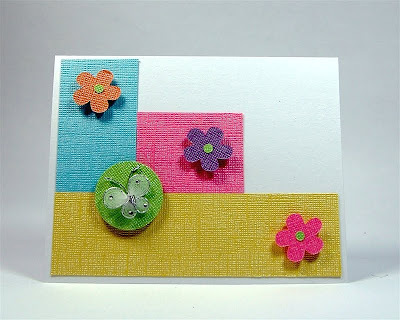 The rectangles are 2 x 2 1/2 inches (and the flower is from Creative Charms). 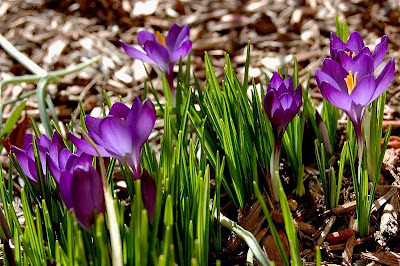 I hope Spring is arriving wherever you are! So pretty,I love the children. This will work great for our church egg hunt. Thanks, keep up the good work. Love the cards. But I especially like the page layout. I just might have to get those cartridges. 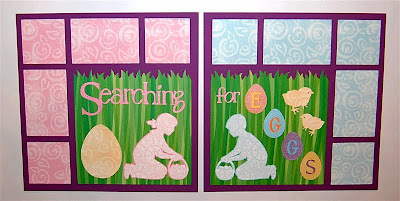 I love the Searching for Eggs. Just wanted to tell you how much I have enjoyed you this week and I have learned so much from you. Thank you, thank you, thank you. Love this layout and I will be making one and buying several new carts so that I can. 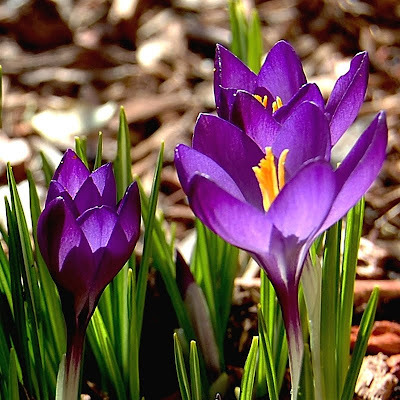 Thanks for sharing more beautiful designs, and the Crocus. I love looking at everything you create! I am so glad you have a blog and share your beautiful work! It inspires me to want to make the time to play NOW!! 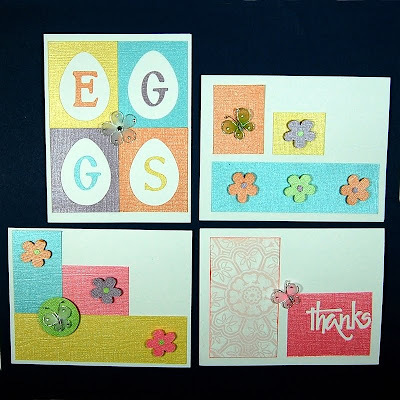 The eggs are great, the cards are wonderful and you used all of your scraps. Yea. I give you a 10. Great ideas! You just sold me on this cartridge! I can't wait to see what else you create. So glad you were the designer this week. I now have your web site marked as a favorite!